The only way I could ever get my husband to eat a strawberry would be if I disguised it as a chocolate treat. For that matter, if I presented him with anything dipped in semisweet Valrhona chocolate—perhaps excluding broccoli or anchovies—he’d eat it with such speed and gusto, he wouldn’t realize what he’d actually consumed until it was well on its way to his small intestine. But I didn’t make these babies today to trick my husband into eating a berry. I just saw the big, fat long-stems at the market and they spoke to me. They said, “Take me home and cover me in chocolate,” which nobody has said to me since I met that guy with a goatee at a disco in the ‘70’s. I’m taking them to a dinner party, where guests will proclaim me a culinary genius. That would be because they have no idea how easy it is to make these things. Here’s the recipe, and, hello, it’s just two ingredients! 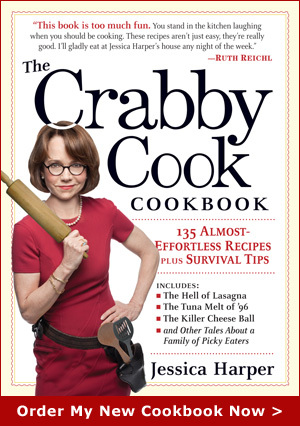 If that doesn’t appeal to your crabby side, I don’t know what will. 2. 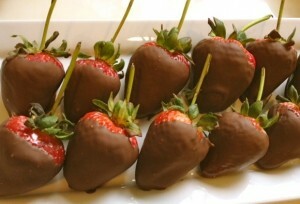 Dip each strawberry into the chocolate until covered, allowing excess to drip back into the bowl. Place the berries on a parchment or wax paper and allow to set, about 20 minutes. This entry was posted on Tuesday, May 1st, 2012 at 12:39 pm	and is filed under Cool Products, Just Desserts. You can follow any responses to this entry through the RSS 2.0 feed. You can leave a response, or trackback from your own site. Sounds yummy, but being lactose intolerant I cannot have chocolate.